Due South Brewing Company Spotted in The New Brewer – Due South Brewing Co. The brewery recently enjoyed some press in the May/June issue of The New Brewer, the Brewer’s Association’s bi-monthly industry journal. 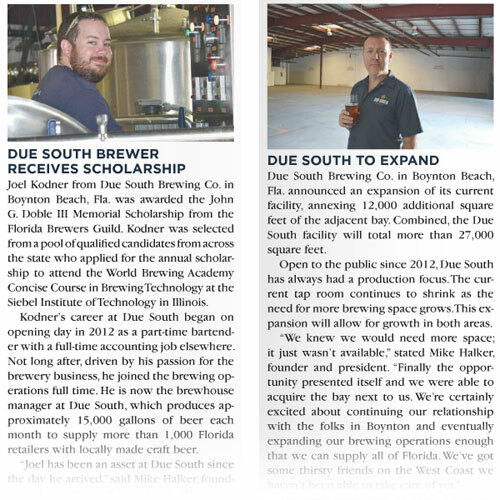 The publication highlighted in their Brewery Updates section our Brewhouse Manager Joel Kodner, who was awarded the John G Doble III Memorial Scholarship from the Florida Brewers Guild which covers costs at the World Brewing Academy Concise Course in Brewing Technology at the Seibel Institute of Technology in Illinois. In addition, they shared the news of our upcoming expansion project, in which we annexed 12,000 additional square feet of the adjacent bay creating over 27,000 square feet of brewery space. The new space will be used for an indoor beer garden, a large air conditioned tap room, a dedicated area for barrel aging and additional offices. There will also be a separate area for expansion of the new ‘Due South Sour Project’. The full stories can be found in the latest issue of The New Brewer, or check out the details of our expansion and Joel’s scholarship in our blog. ⟵May is a Month of Celebration!